(CNN) -- Didier Drogba scored the only goal as Chelsea beat Juventus 1-0 at Stamford Bridge to give Guus Hiddink's side a slender advantage ahead of their Champions League last-16 second leg in Turin. 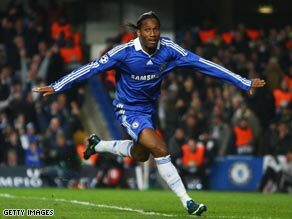 Didier Drogba celebrates his goal as Chelsea took a narrow advantage after their home tie against Juventus. Drogba, his season hampered by injury, suspension and a fallout with axed coach Luiz Felipe Scolari, looked back to his predatory best when he took a pass from Salomon Kalou and despatched the ball beyond Gianluigi Buffon in the 12th minute. Former Chelsea coach Claudio Ranieri, now in charge of Juve, was given a warm reception by the home fans before the game. Ranieri is still held in high esteem by Chelsea supporters even though he failed to win a single trophy during his four-year stint at Stamford Bridge. Hiddink was taking charge of a Chelsea side at home for the first time since his temporary appointment and it was the hosts who made the first inroads towards goal with Jose Bosingwa forcing Buffon into a save with a left-foot shot from the edge of the area in the fourth minute. Four minutes later Drogba almost opened the scoring when he got ahead of his marker to turn a cross from Bosingwa just over the crossbar. But the Ivorian put the home side in front in the 12th minute when a superb through ball from Kalou provided him with a clear-cut shooting opportunity and Drogba supplied the required finish in style. It was the perfect start for the Premier League side although Juventus claimed Drogba was offside before he fired the ball home from 10 yards. In the 15th minute, Drogba should have made it two when he met a corner from Frank Lampard inside the six-yard box, but he inexplicably headed wide. Juventus enjoyed plenty of possession after the interval but found the Chelsea defense in fine form, with Petr Cech only having to deal with a succession of long-range efforts. Marco Marchionni and Alessandro del Piero both tried their luck from distance and Pavel Nedved went close near the end for the visitors. Chelsea also had chances to double their lead, notably when a 20-yard effort from Nicolas Anelka flashed inches wide, but Chelsea held on for the victory. "We maybe should have scored a second goal to give us some breathing space for the second leg. I felt we suffered a little bit in the second half and Juventus are a difficult side to play, but I'm happy with the result," Hiddink told Sky Sports.